This is a long overdue quick review of this watch that I bought some time back. 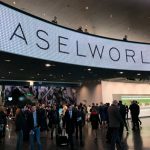 Looking at it now again in 2018, it’s still pretty relevant and amongst the best affordable automatic watches to get if you’re not sure whether a mechanical watch is the one to go and you’ve only worn quartz or smartwatches before this. The Seiko 5 range of watches are part of the five attributes that the watch will have. Now the internet seems to have a mixed explanation of what those five attributes are. One set which I found is automatic winding, water resistance, day/date complication, recessed crown at the 4 o’clock position and durable steel case and bracelet. While another set seems to follow the previous first three attributes along with Diashock anti-shock system and Diaflex mainspring. I don’t think the reasoning for 4 o’clock seems to be valid now as there are Seiko 5s with crowns at 3 o’clock. Anyhow, regardless maybe the 5 is misread for “S” superwatch that can handle most situations if needed. I’m just saying. There’s multiple variants of this particular watch but basically I was contemplating between the SNK809K1 or the SNK809K2. Both are the same except the SNK809K2 features a black canvas strap. I chose the Seiko SNK809K1 as I was curious how the bracelet would be like and it’s a normal practice to always pick a bracelet over 2-piece straps as it’s always harder or more expensive to get back the original bracelet later on. The K version also means that it was made in Malaysia. The stainless steel case is a smaller mid-century size of 37mm which is nicely bead-blasted and sits well on smaller wrists like mine. The case finishing gives it that cool rugged utilitarian look. The crown is positioned at 4 o’clock almost hidden in sight. That’s also one of the negatives as it could be hard to pull it out. 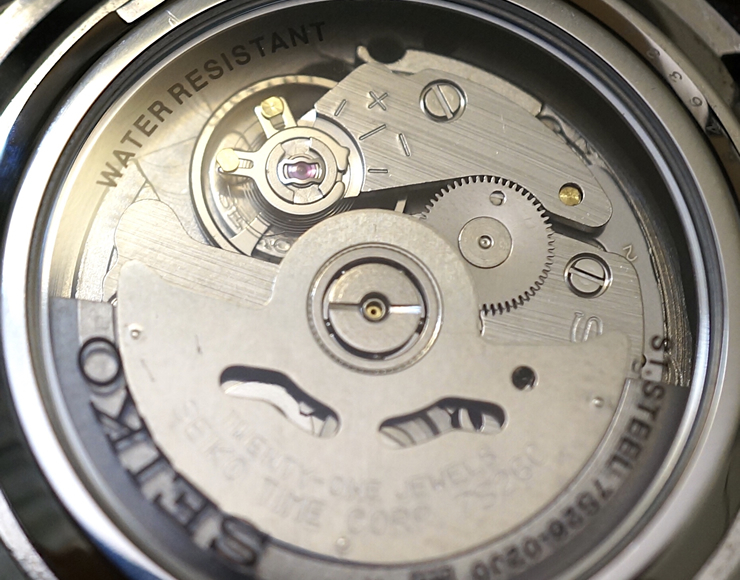 The underside including the see-through caseback is polished and would’ve been nicer if it matched the case. The glass is hardlex which is typical for this price range but definitely not an underperformer as it seems to have held up very well in my other watches. In fact I never had one scratched to date. This case also gives it a water resistance of 30 meters so I wouldn’t go swimming with it. 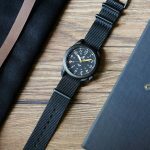 The dial has a deep black dial flieger design and is always distinguishable when it has that triangle at 12 o’clock. It serves two purposes, one is to quickly differentiate from other numbers and the other for pilots to quickly determine the upward orientation. The lozenge hands are lumed and there’s also a lumed dot at every hour interval. 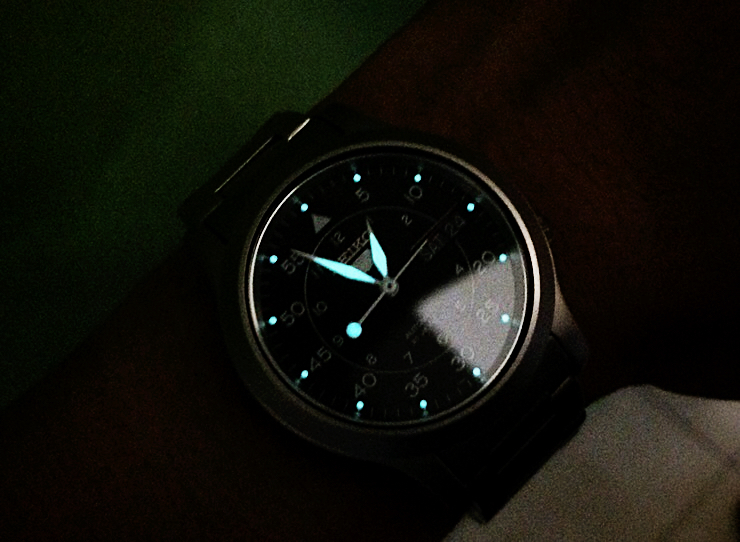 The lume is rather weak as after testing it, it doesn’t seem to glow that long. The lollipop seconds hand has a splash of red at the tip to make it sportier. There’s also a useful black day/date complication that blends in well with the dial. 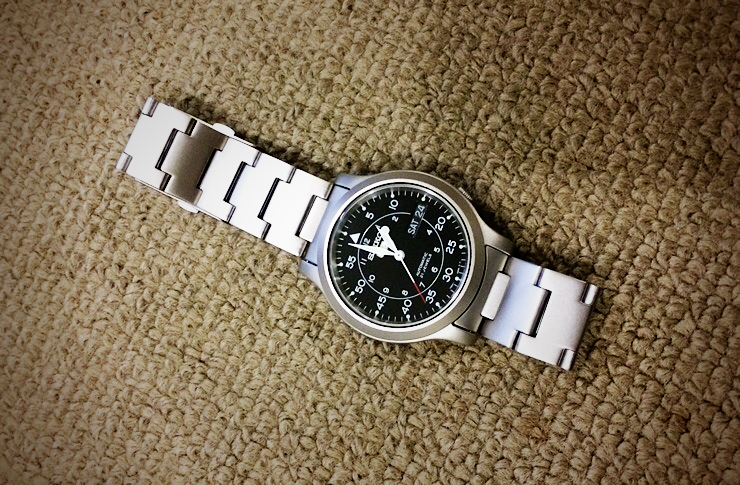 The applied Seiko 5 logo sits right below the 12 o’clock. Lume shot. Pardon the poor quality. The automatic movement is ever reliable workhorse 7S26 non-hacking and non-handwinding found also on the legendary SKX007. This particular one I have is the 7S26C variant which seems to be the latest revision having appearing from 2011 onwards. This 21 jewel movement beats at 21,600 vibrations per hour and also has a power reserve of approximately 40 hours. Accuracy wise, I can get +15 seconds per day which is normal for this movement. It can always be regulated to higher accuracy if needed. The bracelet matches the case very well with that bead-blasted finish. It’s a 18mm bracelet with no taper giving it a beefier look. The finishing is quite nice but don’t expect superb quality as for this price point something has to be sacrificed. The bracelet was slightly scratched out of the box probably by the links brushing against each other however after using it for a few weeks it has held up very well and I did not see any new marks from my desk diving activities. 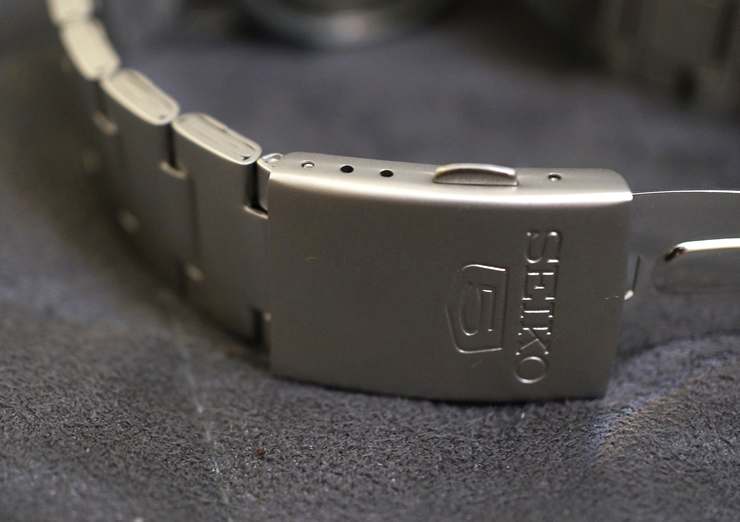 The bracelet has a fold over clasp with easy push-button release and the Seiko 5 engraved on the clasp. The links are also folded which is expected at this price. However I have to say overall it has that Sinn look. It’s comfortable wearing it on the bracelet which is not too light or heavy overall, making you think it could be made of titanium with that matte look. So I highly recommend getting it with the bracelet. I was sourcing for a 7S26 movement for my next modding project but since the price of the movement alone is the same price as this watch, I decided to get this instead. 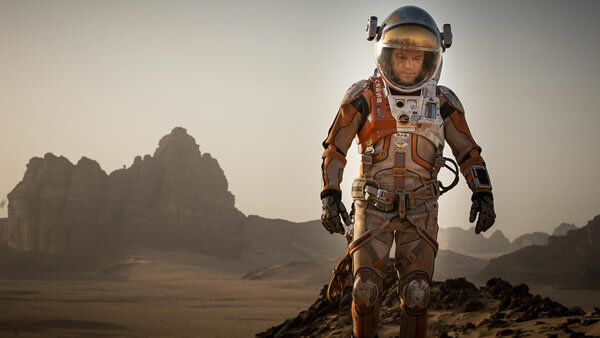 I can also imagine the many modding possibilities if you’re into that by swapping the dials and hands. The military aesthetic paired with the robust movement makes this a no-brainer watch to get. 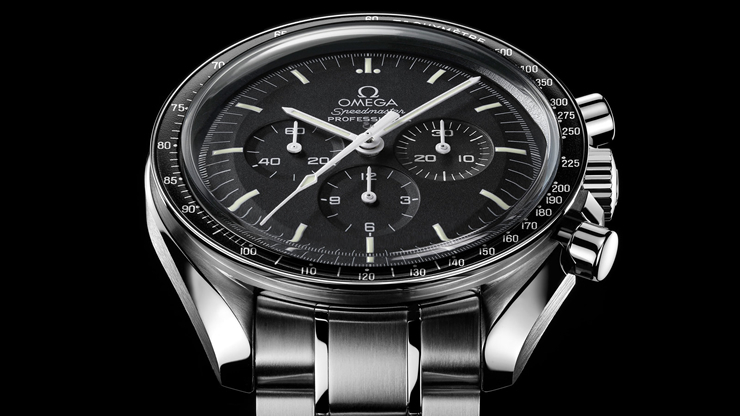 The watch wears smaller because of the small lug distance but perfect for small wrists of around 5.8 to 6.5 inches. I believe this watch is a strap monster and works well with a variety of straps. Swap it out with NATO or distressed leather straps and you will get a different cool look. 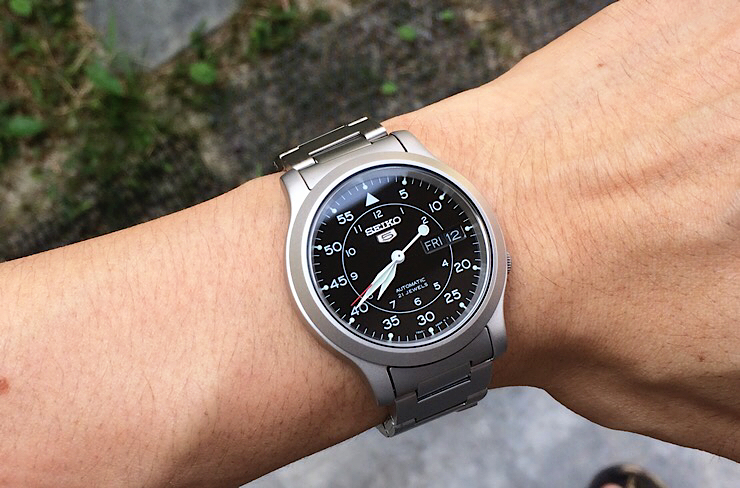 The Seiko SNK809 is highly popular in the watch community and Seiko should be applauded for having such a remarkable piece at this price point. If you’re looking for an affordable automatic mechanical watch to start out with this is the perfect first watch around $100. Available for around $105, you can get it at Amazon.